Champion (Cydonia oblonga 'Champion') produces good crops of Quinces on a regular basis. 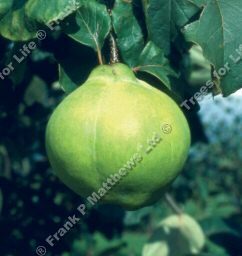 The Quinces are an appealing round pear shape. The fruit is a greenish-yellow colour. Our Quince Champion is supplied at a height of between 1.25 and 2.00 metres in a 12 litre container, which means that the tree has an already established root system and therefore this tree can be planted any time of the year and with better results than either bare-root or rootballed trees. It is also a Half Standard which means it has been pruned to have a standard lollipop shape and a clear stem or trunk to make it look a little more ornamental.